If so, then I frankly don’t see what multinational issues of value – chiefly the pogrom in Syria, Iran’s nuclear ambitions and Gulf security -- can be “sold” or “bought” at the upcoming Tehran bazaar. 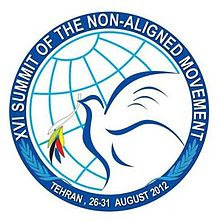 The conference will transform Tehran, which this week takes over the three-year rotating NAM presidency from Egypt, into a hub for hundreds of diplomats, including several heads of state. They range from UN Secretary-General Ban Ki-moon to Egypt’s newly elected President Mohamed Morsi to Armenian President Serzh Sarkgsyan to Qatar’s Emir Sheikh Hamad bin Khalifa Al-Thani to Lebanese President Michel Suleiman to Sudanese President Omar al-Bashir, who is under indictment by the International Criminal Court. Yet, short of a coup de théâtre, Syrian President Bashar al-Assad will stay away and let his Iranian opposite number Mahmud Ahmadinejad do the talking on his behalf. Tehran has already started using the time in the spotlight to show Iran is not isolated and to prepare the ground for giving Assad a shot in the arm. "Iran hosting the Non-Aligned conference is an opportunity to break the notion of sanctions and this false claim by Islam's enemies that Iran is isolated," said Sayyed Hassan Aboutorabi-Fard, parliament’s deputy speaker, in a sermon at Friday prayers. The summit comes as the United Nations and the West have increased sanctions on Iran over its controversial nuclear program. Ms Raghida Dergham, filing yesterday from New York for pan-Arab daily al-Hayat, says Ban Ki-moon “placed himself between the hammer and the anvil” by deciding to attend the NAM conference in Tehran. In his speech to the conference, would Ban tell the host country in the face to come clean on its nuclear program and stop ignoring UN Security Council resolutions and International Atomic Energy Agency (IAEA) warnings? Would the UN chief repeat what he had told al-Hayat in a previous interview that Assad has “lost his legitimacy”? An analysis of a UN General Assembly vote on August 3 condemning the Assad regime’s use of force against its own people showed that 70 of the 120 NAM members voted in favor and only eight voted against with Syria, Iran, China and Russia. Iranian Foreign Minister Ali Akbar Salehi said in remarks published Friday his country -- which describes Syria as part of the “Axis of Resistance” against Israel that it would not allow to be broken and stands accused by Washington of building and training a militia in Syria to prop up Assad -- would submit a proposal to the conference to end the Syria crisis. "[Iran] has a proposal regarding Syria, which it will discuss with countries taking part in the NAM summit," Fars and Mehr news agencies quoted Salehi as saying on state television. "This proposal is an acceptable and rational one, which includes all parties. Opposing it will be very difficult," the minister was quoted as saying. Salehi renewed an Iranian offer to host talks between Damascus and the opposition after the NAM summit and the annual UN General Assembly meeting in September. He said a "significant part of the Syrian opposition" was ready to participate but did not specify which opposition groups. Editorially, Kuwait University professor and Gulf security expert and published author Zafer M. al-Ajami, writing for Bahrain’s daily al-Watan, believes leaders of the Gulf Cooperation Council (GCC) grouping Saudi Arabia, Oman, Kuwait, Bahrain, Qatar and the United Arab Emirates should shun the NAM summit in Tehran. Tariq Alhomayed, editor-in-chief of Saudi Arabia’s newspaper of records, dubs the summit of the Non-Aligned in Tehran “an alignment summit” par excellence. Accordingly, Alhomayed writes, ending Iran’s isolation means subscribing to its nuclear ambitions and its drive to undermine the Arab countries’ political economic and social interests and to tighten its hold on Iraq, Lebanon and Syria. What the region needs to do, Alhomayed says, is challenge the alignment of Russia, China and Iran against the Syrian people.